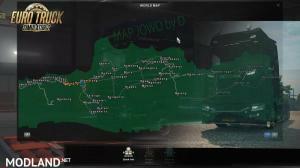 Map Jowo is a map for the game Euro Truck Simulator 2 which consists of several cities in Java, Indonesia. This map is suitable for you who like the local atmosphere, especially Java and currently Jowo map has been updated with version 7.2 for ETS2 V1.30 game. According to D-Official as the source of this Map Jowo, this folder is only upgarde devoted to users of ETS2 Version 1.30. There are no city or model additions in this version. Map Jowo V7.2 is a refinement of the previous version. 2. Put 3 files in one folder. 3. Right-click on the file “MJ 7.2 (ets_2_v.1.30) .7z.001”, then select “Extract Here”. 5. The 3 files will be automatically extracted. 7. Copy mj_base.zip & mj_map.zip to the mod folder. 8. Enable both modes in manager mode (see example mod manager image). 9. Select Playing Module “ina.mbd”. 1. At v 1.30 no longer required “mj climate” mode. 2. If you have DLC Vive La France, and crashes while using Jowo Map, you can unplug it before it crashes. Dear uploader When i start the game, why ask about previous save ? Is it need a previous save game ? Please ask ASAP ! Does it work with v1.32?